What is involved in the multiple editing of permissions? As part of the manual modification of permissions, it is also possible to edit multiple records at the same time. Various mechanisms can be used here to select the records to be edited. This could involve selecting the records in list view or also using the filter as part of the multiple editing function. Both scenarios are described below. This mode is inactive by default and firstly needs to be activated. Individual rights can be supplemented or removed via Multiple editing within list view. The existing rights will not be overwritten here. In list view, Shift or Ctrl + mouse click can be used to select multiple records. Permissions can also be granted for these records at the same time via the selection. The marked records are displayed in a different colour to usual. 6 records are marked in the following image. A new tab will be opened in the ribbon above the Permissions button in which the rights to be granted can be configured. The tab will display the number of records that will be affected by the defined changes. *As the already granted rights for the selected records may differ, it is not possible to display the rights here. To add a right, a user or role is selected first in the ribbon under Search and add or Search. The permissions are then selected as usual in the ribbon. The symbol indicates that right will be added. In the following example, Mr. Steiner receives read rights to all selected records. In contrast, Mr. Brewery receives all rights. If you want to remove rights, it is also necessary to firstly add the user or the desired role to be edited. Clicking on Reduce rights now means that rights will be removed. This is indicated by the symbol. The rights to be removed are then selected. *If the read right is to be removed for a user or role, the user will be completely removed from the permissions. In some cases it is necessary to edit the permissions for a very large number of records. On the one hand, a maximum limit of 1000 records exists and on the other had, handling a very large number of records via list view is not always the best solution. The Batch processing using a filter mode has been developed for this purpose. This is directly initiated via the ribbon. 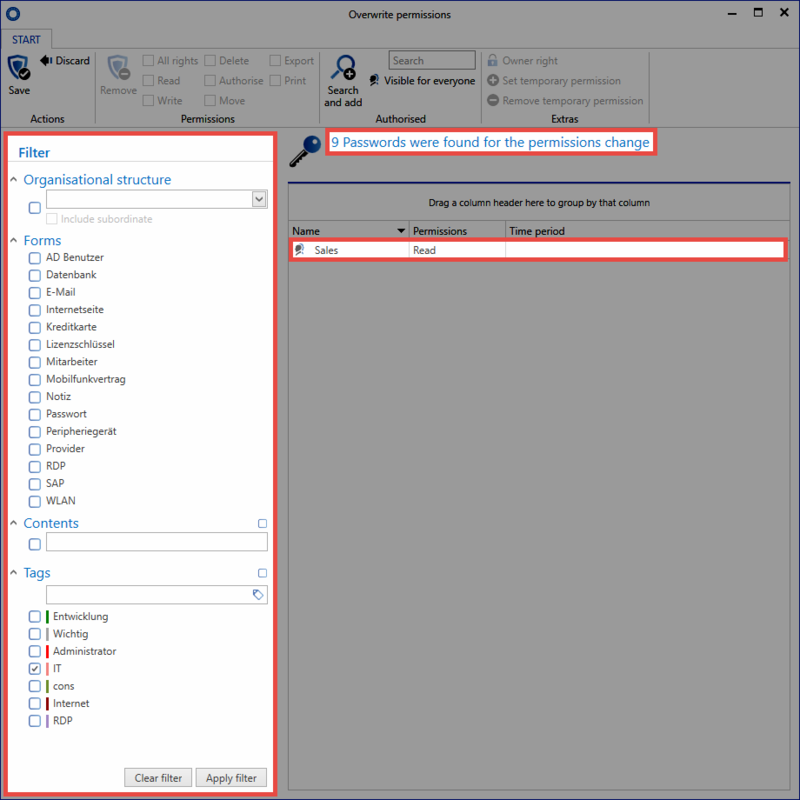 In the subsequent dialogue, you define whether you want to expand, reduce or completely overwrite existing permissions. If you select expand or reduce at this stage, the same logic as for editing via list view is used. No rights will thus be overwritten. In the option overwrite permissions, the existing rights are firstly removed and then replaced by the newly defined rights. !It is important to proceed with great caution when overwriting rights because this function can quickly lead to a large number of records becoming unusable. The filter itself defines the selection criteria for the records to be edited. The currently configured filter will be used as default. The records that will be affected by the changes are also not displayed in this view. Only the number of records is displayed. In the following example, 9 passwords are being edited to give the role “Sales” the read right. Sealed or masked records cannot be edited using batch processing. If these types of password are selected, a dialogue will be displayed when carrying out batch processing to inquire how these records should be handled. It is possible to select whether the affected records are skipped or whether the seal or password masking should be removed. If the remove option is selected, the process needs to be confirmed again by entering a PIN. !The removal of seals and password masking cannot be reversed! *Depending on the number of records, editing records may take a long time. This process is carried out in the background for this reason. A hint will indicate that the permissions process has been completed.